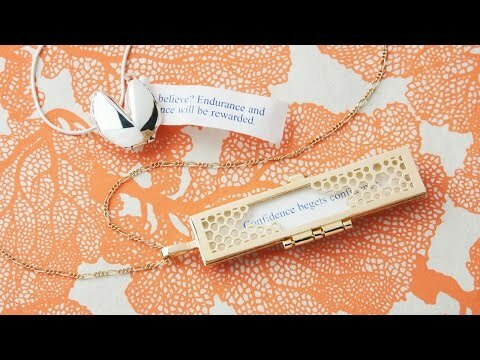 Slip some words of wisdom into this intricately patterned fortune locket. The brass and gold-dipped honeycomb design frames your note beautifully—where you and others can enjoy it. Place your own fortune inside or wear the one we’ve hand selected; the clasp makes it easy to swap out. The sentiment behind them is reminiscent of the classic, heirloom-y locket you might inherit and slip an old photo into—except these necklaces encourage you to look into the future as much as the past. Dimensions: Charm: 2.75" x 0.5" x 0.125"; Chain length: 30"
These fortune lockets and pendants each contain an elegant note-to-self as a wearable reminder. Maker Gretel Going believes it’s important to hold your inspiration close. After she found an insightful fortune in a cookie and put it on the fridge, she set out on a long journey to learn jewelry design in hopes of creating a better, more beautiful way of showcasing fortunes. From delicate metal envelopes that showcase slips of paper to tiny, hinged fortune cookies that hold words of wisdom, each elegant necklace carries a personally meaningful message. The sentiment behind them is reminiscent of classic, heirloom lockets you might inherit and slip an old photo into. Except these necklaces encourage you to look into the future as much as the past.